These three meadows contain a diverse range of habitats from ridge and furrow grassland to wet carr woodland. The meadows form part of a long chain of around 60 important grassland sites stretching from Pershore to Astwood Bank. Nearby are Holberrow Green, Inkberrow’s Millennium Green, Morton Bank and Stockwood Meadows. The meadows were designated as a Local Wildlife Site in 1990. Around 60 species of grasses and flowering plants have been recorded in the meadows. Since buying the meadows in 2011 we’re working to increase these numbers using appropriately timed haymaking and grazing. Sands Meadows fall within the ever-increasing range of the nationally rare brown hairstreak butterflies. Following a concerted conservation project, the range and population of this butterfly is increasing. They rely on young blackthorn growth and the hedges around the boundary of Sands Meadows have the potential to be suitable habitat for the butterfly. There’s a scarce black poplar tree on the reserve. These trees get their name from the gnarled and bumpy bark that looks very dark from a distance. 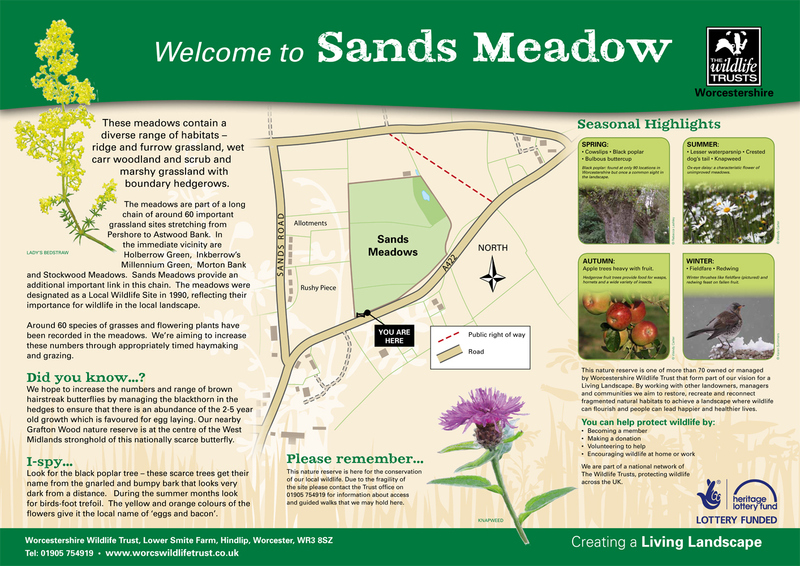 Visit our Community pages to download our Meadows Butterfly spotting sheet. Many thanks to the Heritage Lottery Fund for enabling the Trust to purchase these beautiful meadows in 2011. Due to the fragility of this site reserve please contact the Trust about information on access and guided walks. Dawn to dusk. Due to the fragility of the site please contact the Trust for access information. No pathways. Grassland slippery when wet. Limited parking on lane nearby.